AUD 8,488 Excl. Duties / Taxes. This Emerald diamond is 1.02 carat in weight, and comes with Excellent polish and Excellent symmetry, as verified from an independent gemological laboratory. The diamond is graded E in colour, and has a clarity grade of FL. The diamond's GIA grading report number is 6194821774, which will detail further its specifications and measurements, and will also come with the purchase of the stone. AUD 13,944 Excl. Duties / Taxes. This Emerald diamond is 1.12 carat in weight, and comes with Excellent polish and Very Good symmetry, as verified from an independent gemological laboratory. The diamond is graded D in colour, and has a clarity grade of FL. The diamond's GIA grading report number is 5191749476, which will detail further its specifications and measurements, and will also come with the purchase of the stone. AUD 9,979 Excl. Duties / Taxes. This Emerald diamond is 1.03 carat in weight, and comes with Excellent polish and Excellent symmetry, as verified from an independent gemological laboratory. The diamond is graded E in colour, and has a clarity grade of FL. The diamond's GIA grading report number is 7201285919, which will detail further its specifications and measurements, and will also come with the purchase of the stone. AUD 1,29,248 Excl. Duties / Taxes. This Emerald diamond is 3.02 carat in weight, and comes with Excellent polish and Excellent symmetry, as verified from an independent gemological laboratory. The diamond is graded D in colour, and has a clarity grade of FL. The diamond's GIA grading report number is 5191036219, which will detail further its specifications and measurements, and will also come with the purchase of the stone. AUD 14,548 Excl. Duties / Taxes. This Emerald diamond is 1.2 carat in weight, and comes with Excellent polish and Excellent symmetry, as verified from an independent gemological laboratory. The diamond is graded D in colour, and has a clarity grade of FL. The diamond's GIA grading report number is 7311661735, which will detail further its specifications and measurements, and will also come with the purchase of the stone. AUD 9,149 Excl. Duties / Taxes. This Emerald diamond is 1.01 carat in weight, and comes with Excellent polish and Very Good symmetry, as verified from an independent gemological laboratory. The diamond is graded E in colour, and has a clarity grade of FL. The diamond's GIA grading report number is 2274856422, which will detail further its specifications and measurements, and will also come with the purchase of the stone. AUD 20,252 Excl. Duties / Taxes. This Emerald diamond is 1.41 carat in weight, and comes with Excellent polish and Very Good symmetry, as verified from an independent gemological laboratory. The diamond is graded D in colour, and has a clarity grade of FL. The diamond's GIA grading report number is 5192817295, which will detail further its specifications and measurements, and will also come with the purchase of the stone. This Emerald diamond is 0.34 carat in weight, and comes with Excellent polish and Very Good symmetry, as verified from an independent gemological laboratory. The diamond is graded D in colour, and has a clarity grade of FL. The diamond's GIA grading report number is 5192771583, which will detail further its specifications and measurements, and will also come with the purchase of the stone. AUD 54,413 Excl. Duties / Taxes. This Emerald diamond is 3.21 carat in weight, and comes with Excellent polish and Excellent symmetry, as verified from an independent gemological laboratory. The diamond is graded H in colour, and has a clarity grade of FL. The diamond's GIA grading report number is 2185933396, which will detail further its specifications and measurements, and will also come with the purchase of the stone. AUD 51,475 Excl. Duties / Taxes. This Emerald diamond is 2.02 carat in weight, and comes with Excellent polish and Excellent symmetry, as verified from an independent gemological laboratory. The diamond is graded D in colour, and has a clarity grade of FL. The diamond's GIA grading report number is 5191726978, which will detail further its specifications and measurements, and will also come with the purchase of the stone. This Emerald diamond is 0.34 carat in weight, and comes with Excellent polish and Very Good symmetry, as verified from an independent gemological laboratory. The diamond is graded E in colour, and has a clarity grade of FL. The diamond's GIA grading report number is 2191672089, which will detail further its specifications and measurements, and will also come with the purchase of the stone. AUD 12,117 Excl. Duties / Taxes. This Emerald diamond is 1.02 carat in weight, and comes with Excellent polish and Excellent symmetry, as verified from an independent gemological laboratory. The diamond is graded D in colour, and has a clarity grade of FL. The diamond's GIA grading report number is 6204108742, which will detail further its specifications and measurements, and will also come with the purchase of the stone. AUD 1,29,001 Excl. Duties / Taxes. This Emerald diamond is 3.11 carat in weight, and comes with Excellent polish and Excellent symmetry, as verified from an independent gemological laboratory. The diamond is graded D in colour, and has a clarity grade of FL. The diamond's GIA grading report number is 1182821887, which will detail further its specifications and measurements, and will also come with the purchase of the stone. AUD 85,199 Excl. Duties / Taxes. This Emerald diamond is 3.23 carat in weight, and comes with Excellent polish and Excellent symmetry, as verified from an independent gemological laboratory. The diamond is graded F in colour, and has a clarity grade of FL. The diamond's GIA grading report number is 2191800779, which will detail further its specifications and measurements, and will also come with the purchase of the stone. This Emerald diamond is 0.6 carat in weight, and comes with Excellent polish and Excellent symmetry, as verified from an independent gemological laboratory. 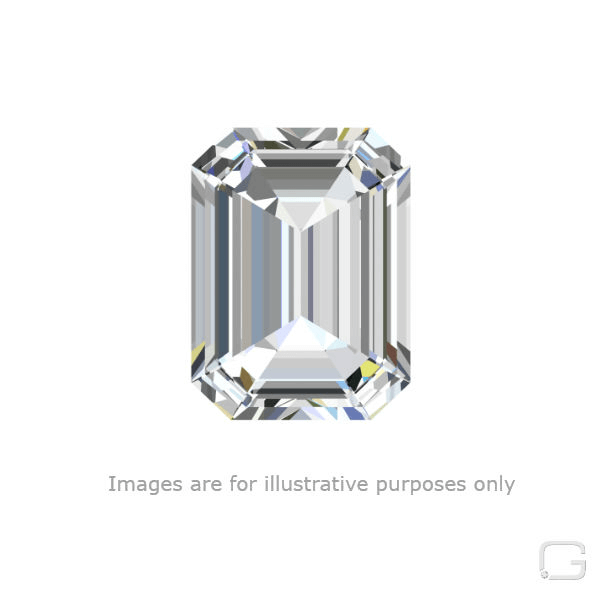 The diamond is graded G in colour, and has a clarity grade of FL. The diamond's GIA grading report number is 6212577265, which will detail further its specifications and measurements, and will also come with the purchase of the stone. AUD 3,073 Excl. Duties / Taxes. This Emerald diamond is 0.7 carat in weight, and comes with Excellent polish and Very Good symmetry, as verified from an independent gemological laboratory. The diamond is graded G in colour, and has a clarity grade of FL. The diamond's GIA grading report number is 2205024322, which will detail further its specifications and measurements, and will also come with the purchase of the stone. AUD 2,808 Excl. Duties / Taxes. This Emerald diamond is 0.73 carat in weight, and comes with Excellent polish and Very Good symmetry, as verified from an independent gemological laboratory. The diamond is graded G in colour, and has a clarity grade of FL. The diamond's GIA grading report number is 5192997566, which will detail further its specifications and measurements, and will also come with the purchase of the stone. AUD 42,791 Excl. Duties / Taxes. This Emerald diamond is 3.13 carat in weight, and comes with Excellent polish and Excellent symmetry, as verified from an independent gemological laboratory. The diamond is graded I in colour, and has a clarity grade of FL. The diamond's GIA grading report number is 2306136347, which will detail further its specifications and measurements, and will also come with the purchase of the stone. This Emerald diamond is 0.51 carat in weight, and comes with Excellent polish and Very Good symmetry, as verified from an independent gemological laboratory. The diamond is graded I in colour, and has a clarity grade of FL. The diamond's GIA grading report number is 5172516993, which will detail further its specifications and measurements, and will also come with the purchase of the stone. This Emerald diamond is 0.4 carat in weight, and comes with Excellent polish and Very Good symmetry, as verified from an independent gemological laboratory. The diamond is graded D in colour, and has a clarity grade of FL. The diamond's GIA grading report number is 5191598157, which will detail further its specifications and measurements, and will also come with the purchase of the stone. This Emerald diamond is 0.4 carat in weight, and comes with Excellent polish and Excellent symmetry, as verified from an independent gemological laboratory. The diamond is graded D in colour, and has a clarity grade of FL. The diamond's GIA grading report number is 2191793191, which will detail further its specifications and measurements, and will also come with the purchase of the stone. AUD 54,327 Excl. Duties / Taxes. This Emerald diamond is 2.13 carat in weight, and comes with Excellent polish and Excellent symmetry, as verified from an independent gemological laboratory. The diamond is graded D in colour, and has a clarity grade of FL. The diamond's GIA grading report number is 6204095869, which will detail further its specifications and measurements, and will also come with the purchase of the stone. AUD 25,905 Excl. Duties / Taxes. This Emerald diamond is 1.5 carat in weight, and comes with Excellent polish and Excellent symmetry, as verified from an independent gemological laboratory. The diamond is graded D in colour, and has a clarity grade of FL. The diamond's GIA grading report number is 2191956806, which will detail further its specifications and measurements, and will also come with the purchase of the stone. AUD 95,837 Excl. Duties / Taxes. This Emerald diamond is 3.05 carat in weight, and comes with Excellent polish and Excellent symmetry, as verified from an independent gemological laboratory. The diamond is graded E in colour, and has a clarity grade of FL. The diamond's GIA grading report number is 6193546032, which will detail further its specifications and measurements, and will also come with the purchase of the stone. AUD 11,993 Excl. Duties / Taxes. This Emerald diamond is 1.01 carat in weight, and comes with Excellent polish and Excellent symmetry, as verified from an independent gemological laboratory. The diamond is graded D in colour, and has a clarity grade of FL. The diamond's GIA grading report number is 2201080638, which will detail further its specifications and measurements, and will also come with the purchase of the stone. AUD 9,321 Excl. Duties / Taxes. This Emerald diamond is 1.05 carat in weight, and comes with Very Good polish and Good symmetry, as verified from an independent gemological laboratory. The diamond is graded F in colour, and has a clarity grade of FL. The diamond's GIA grading report number is 2196966235, which will detail further its specifications and measurements, and will also come with the purchase of the stone.